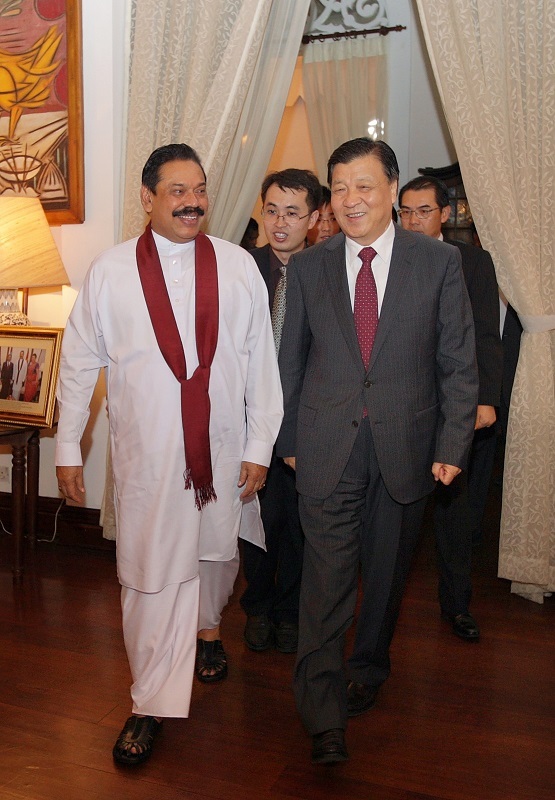 Senior official of the Communist Party of China (CPC) Liu Yunshan who is on an official visit to Sri Lanka called on President Mahinda Rajapaksa to promote bilateral cooperation at the President”‘s House on Tuesday (10 September). During the meeting with the President the Standing Committee member of the Political Bureau of the CPC Central Committee, lauded the significant development of the bilateral ties since the establishment of diplomatic relations in 1957. He said that Sri Lanka”‘s political environment and economic growth are tremendous. He assured continued assistance for Sri Lanka”‘s economic growth. The visiting Chinese leader thanked Sri Lanka for its long-term support on issues involving China’s core interests, adding that China is happy to see national reconciliation and massive economic developments in Sri Lanka in recent years. He also pledged assistance to upgrade the living standards of the people, generate more employment and implement programmes based on industrial products and also for the tourism industry in Sri Lanka. Chinese leader Liu also said the decision made by the two sides to upgrade of bilateral ties to a strategic cooperative partnership during President Rajapaksa’s state visit to China last May, has marked the future direction of the development of the China-Sri Lanka relationship. China is willing to join Sri Lanka in maintaining high-level visits, deepening trade and economic cooperation, and promoting exchanges in education, technology, culture and media so as to bring more benefits to both countries, said the CPC official. Speaking of the inter-party relations, senior official of the Communist Party of China, Liu said the CPC would like to work with the ruling Sri Lanka Freedom Party to expand their exchanges and bring in more strength into bilateral cooperation. President Rajapaksa also thanked China’s long-term assistance and support and highlighted of the centuries old traditional friendship between the two countries. A high-level Chinese delegation accompanied senior official of the CPC Liu, including several Vice Ministers of the CPC Central Committee and China”‘s Ambassador in Sri Lanka Wu Jianghao. Minister of Mass Media and Information Keheliya Rambukwella, Minister of Irrigation and Water Resources Management Nimal Siripala de Silva, Minister of Investment Promotion Lakshman Yapa Abeywardena, Deputy Minister of the Ministry of External Affairs Neomal Perera, Monitoring MP of the Ministry of Mass Media and Information A.H.M. Azwer, Secretary to the Ministry of External Affairs Karunatilaka Amunugama and Sri Lanka”‘s Ambassador to China Ranjith Uyangoda were among those present on the occasion.